→How Long Will It Take to Make Money with Wealthy Affiliate? A big question that comes up from newbies at Wealthy Affiliate, or before joining, is how long does it take to make money? It’s a good question that everyone should be asking and it’s something that I can give some good insight on. I’ve been a member since 2015 and not only have I been through the whole experience myself, but I have also seen hundreds of others go through it as well. It can be a struggle early on and if you have false expectations or don’t really know what you are getting into, you are more likely to end up quitting and then this would all be a waste of time. 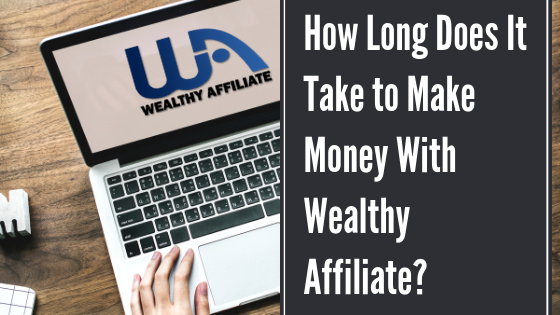 So how long does it take to make money with Wealthy Affiliate you ask? Well… in order to get to the best answer possible and really explain it all, lets first take about how WA works and some key factors that are going to effect the time it takes for you to start earning that money you have been dreaming about. Wealthy Affiliate in a nutshell is an online business platform that provides training for beginners looking to make money online. The main focus here is on affiliate marketing through your own website that you drive traffic to via SEO (through Google, Yahoo, Bing, etc). The awesome part of this entire business model is that it requires extremely little startup cost and has the potential to be very lucrative… the downside is that it TAKES TIME… and for those that are impatient and need cash now it may be a struggle. Most people will tell you that it will take 3 months or so until you start seeing some money trickle in, but this really isn’t a good answer. You could potentially see money in less (although highly unlikely) but it also could take a while longer. Unfortunately WA isn’t going to cut it in this situation. I often see people join who are in financial situations where they need money immediately. If you are someone like this then I don’t want to give you false hope. Yes you can earn money with WA and yes you can earn a lot… but you sure as heck aren’t going to be earning an immediate income, or anything quickly. 1. Time Spent – It’s a given that most of the time when you put more time and work into things you get faster and better results. Now of course this doesn’t always work out perfectly and you don’t want to work so hard that you burn out, but generally speaking those who put in more time are going to see faster results. That said, I actually would suggest starting off on the rather slow side of things rather than jumping in head first and spending 5+ hours a day on this stuff, reason being that it will likely be overwhelming if you jump in too fast and you will likely make more mistakes that just end up as wasted time. 2. Action Taken – Something else you have to think about and consider is the action taken. You can spend a bunch of time working but if that time isn’t being spent properly on real action, there isn’t much point of it. Don’t spend 10 hours trying to tweak some simple thing on your site that might only take 5 minutes to do. Early on I always see people getting caught up on the small unimportant things that are just not worth the effort. The best advice I can give is to simply follow the core training at WA and to not veer off from that too much. Your site doesn’t need to look like some professionally designed masterpiece early on. No one is going to be trafficking it anyhow, so what’s the point? You will learn a lot as you follow along with the training and things that might have taken you a long time early on will only take you a minuscule amount once you know what you are doing. 3. Quality of Work – This is also a big deal that certainly plays a major factor in the timing of success. Are you creating good quality content? I know this is hard to judge early on as a beginner, but just give it your best shot. I also remember when I started and thinking that my posts were never good enough… don’t worry… you will get there with time. It’s amazing how far you will come with practice and just putting in the work. Also, you don’t want to make your content “too good”. What I mean by this is that you don’t want to spend ridiculous amounts of time trying to make each post perfect. Put out good quality content without being too nitpicky. And DEFINITELY DO NOT duplicate content or use content spinners. Sure, you can publish lots of content very quickly this way but you are just going to be hurting yourself. Google will punish you for the duplicate content and content that has been spun always has problems in one way or another. 4. Keywords Targeted – It’s all about keywords… well… as lot of it has to do with this anyhow. If you are targeting good keywords and putting out good content then you are doing things right, at least as far as the quality of your work goes. Early on I highly recommend that you target what are called “long tail keywords”. These are keywords that are a bit more lengthy and usually consist of 4+ words. These are much more targeted and because of this there is less competition among them. Early on your site will be small and have little to no authority, so your best chances of success are by using keywords like this. 5. Competition in Your Chosen Niche – Competition from others websites also plays a big role. If you choose a niche that has little to no competition, then you are going to be able to really see your business grow relatively quickly without being beat down by larger authority sites. But unfortunately you aren’t going to be able to find a niche with no competition. There is always competition… but that doesn’t mean you can’t make it. There is a ton of opportunity out there… it’s just obviously the more desirable to go into a niche or micro-niche that doesn’t have insane amounts of competition. 6. Google Doesn’t Like New Sites – It’s true…. well… maybe not completely true, but for the most part it is. Anyone that has created a website looking to rank on Google knows well that they don’t care for new sites. Or I guess it would be better stated that they don’t trust new sites, which is why they don’t get ranked well. It really doesn’t matter how good of content you are putting out and how good your niche is… a new site is a new site, and Google won’t treat it very well. As I mentioned earlier, a lot of people will tell you that it is around the 3-month mark when you can expect to start seeing some money come in. While there is no hard proof of this, it does seem to be true to some extent and Google plays a major part in it. It just seems that around that time is when the trust factor starts to really develop with Google. When it comes to making money online it is going to cost you either time or money…. and time is money. It doesn’t really matter what path you take… you could get instant traffic to your site by running paid ads.. but then you are going to have to spend money upfront and it is a lot more risky. I’ve blown through tons of money running ads and know this for myself. Or… you can choose the path that Wealthy Affiliate sets in place for you… in which you can get free traffic from Google and other search engines… it’s a lot less risky but of course it takes time. Sadly, there is no set in stone answer that I can give for the time frame of making money with Wealthy Affiliate. My best answer… if I had to give you numbers to go by… would be somewhere between 3-6 months I guess… but even that is just a very general statement that you have to take with a grain of salt. It’s no secret that a lot of people fail with any sort of online business. But the reason for failure may not be what you expect… at least not for this business model. There is no doubt that giving up too early is by far one of the biggest reasons for failure. It certainly is not the only reason but it is a big one. And it makes perfect sense if you think about it. Lots of people join with unrealistic expectations. They think making money online is some fairy-tale where you can “plug-in” and start raking in the dough. There are a lot of scams out there that suggest this type of thing is true… which is why many believe in it. After working on things for a month or so with no money to show for it… they think it must be a scam or something and give up. YOU CAN’T GIVE UP TOO EARLY… YOU JUST CAN’T! What if you’re the person who makes it close but quits just before hitting the diamond mine? If you aren’t already a member of Wealthy Affiliate and are looking to join, you can join through my link here and I’ll help you out along the way. It’s a free mentor service if you want to think of it like that. It doesn’t cost you any extra… I’ll just answer questions, give you advice and my opinion of things, help you decide what direction to take your online business, etc. It’s something I do for anyone who signs up through me as a way to help.